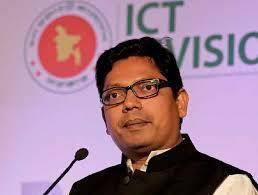 State Minister for ICT division Zunaid Ahmed Palak has said the present government will set up 28 ICT parks across the country. He was speaking as the chief guest at a function in Natore on Saturday on the inauguration of Sheikh Russel Digital Lab at Gol-e-Afroz Govt. College in Singra upazila of the district. Hailing the Prime Minister Sheikh Hasina and her son Sajeeb Wazed Joy, Palak said Bangladesh would be a model country for the development of ICT in the world. The minister said the present government is committed to fight against militancy and terrorism. He urged people to reelect Sheikh Hasina for continuing peace, progress and development of the country. Principal of Gol-e-Afroz College Atikur Rahman presided over the function. Later, the minister distributed seeds and fertilizers among the flood-affected farmers in Chalan Beel area.